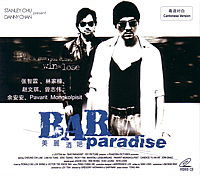 The first thing that caught my attention was the cover of Bar Paradise VCD’s cover. It has this cool black and white feature that invokes a noir feeling to it. But after watching Bar Paradise, the conclusion would be that the cover was the only good thing about this movie. It has an incomprehensive plot without any clear direction that it’s heading and it tried to impress by planting too many weak subplots which of course became a test of patience. Let me fill in the plot (or subplots) that was the bulk of this movie instead of the synopsis had stated (which only occurs a few seconds before the credits and another few seconds near the end). First we got Julian Cheung with his unshaven dark shades rugged image, signing up to become a bar bouncer, working for an owner with an ambiguous gender (of course, since it’s based in Thailand and with all the stereotypical movies about it, all pretty girls should be suspected as a transvestite or transgender). Trouble soon followed as a rogue (Gordon Lam Ka Tung) with his noisy girlfriend crashed into the bar to escape the wrath of a lady mob boss. A confrontation occurs but due to the mysterious identity of Julian Cheung character and the bar owner, it quickly became a standoff and the lady mob boss backs off for a while. Then Eric Tsang appears as an authoritative figure in cahoots with the lady mob boss and subsequently discover the appearances of Julian Cheung and the bar owner. This baffling movie then tries to introduce more mysterious connection between them and firing all it’s effort at other unimportant subplots such as Gordon Lam ‘s extremely jealous girlfriend, an abandon baby and some supposedly good friend of the bar owner who is trying to borrow money for her useless boyfriend. In the end, it only managed to effectively not build any importance to the revelation of the mysterious connection or what the synopsis was trying to sell. Called it bad management of characters and plots or biting off way too much than it can chew, there is definitely no paradise to be found in this story.